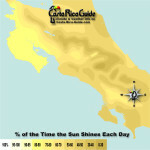 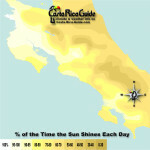 The contour maps of Costa Rica below show the average monthly Rainfall, Hours of Sunshine per day, and Average Number of Sunny Days for each month of the year and every region of Costa Rica color coded by the legend at the bottom of each. 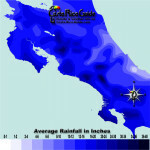 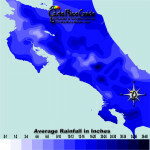 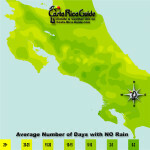 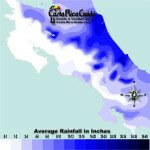 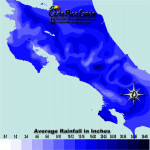 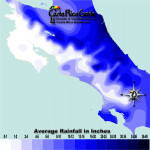 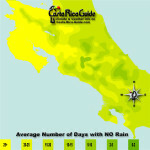 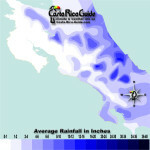 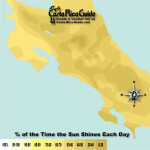 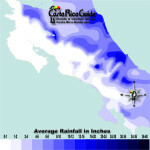 There are a number of other weather map resources on Costa Rica Guide including a series of maps like this for high and low temperatures each month of the year for each region, an action packed little map that pops up a chart of rainfall for each month when you mouseover any region and another that does the same for temperatures. 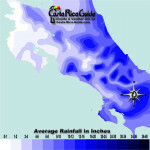 A long article with lots of diagrams explains the basics of how weather works in Costa Rica, a live map of today’s weather, current storms, and there are even instructions to make your own accurate weather forecast. 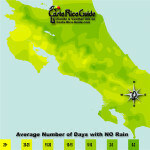 If this is all WAY more than you were looking for then the general weather tendencies for every month of the year are summarized on the Best Time To Visit Costa Rica page along with a calendar of sea turtle nesting, whale migrations, quetzal nesting, surf size, tides charts, holidays, fiestas and music festivals for every month of the year. 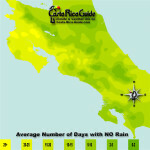 You may be looking at these maps and wondering how they can simultaneously show so much rainfall and so much sunshine and days without rain. 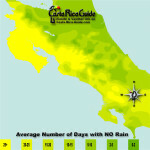 There are two main reasons. 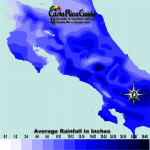 First, most of the rain falls in fairly heavy storms so while there may be a downpour for a couple of hours there will also be 8 or 10 hours of sunshine that day as well. 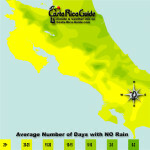 The second reason is that much of the rain (65-80% depending on the micro-climate) falls overnight.